My Grampa was an old-time fiddler. He left me his fiddle in the hopes I would learn to play. It hasn't been played in probably 20 years, and I know absolutely nothing about the keeping of a fiddle. Where should I start, and how do I figure out if my grampa's fiddle is anything more than a keepsake now? Try looking in one of the "f" holes and see if there is a small label on the bottom of the violin. If so, what does it say ? I will try that. First I need to retrieve it from my grandma's house, hopefully without too much sadness for her to let it go. I have no idea where it came from, but I would guess it is easily 50 years old. I am fairly sure it was not my great-grandfather's fiddle, though. First place to start will probably be to change the strings. I can't imagine your grandma being sad. She will probably feel honored that you care enough to come and get it. Make sure that the bridge is fairly straight and perfectly erect while tuning it. You can find a great tuner on my LEARNING TOOLS menu above. When did he last play it before passing? I hope you do learn to play it. What a lovely way to honor your Grandpa's memory. I've learned so much from my mistakes that I've decided to make some more. Make sure there are no cracks or open seems. An open seem will have a whitish line where the seem is. look for cracks around the f holes and down the length of the middle. Take a good look at the neck and make sure there are no cracks in the varnish as this can mean a loose neck. Now check the sound post, making sure it is standing up. If the bridge is good then get some new strings from fiddlershop.com, string it up and start playing. I'm sure the value in this violin has nothing to do with who made it or how much money it is worth. We know as you play it you will feel close to your grandfather and it will bring back so many memories. If you have any doubt about something being right with the violin take a picture of the area in question and put it up here. I'll look at it , as will many others who repair and build violins, and we can guide you through repairing it if needed. For real close pictures use a macro setting on your camera if it has that feature. Thanks guys. I will do as you advise. My grandpa had Parkinson's for a long time, and passed away about 15 years ago. He would have been 100 years old last year if he were still alive. The fiddle hasn't been played in more than 20 years, and he gave up playing Saturday nights at the Grange when it closed 40 years ago, so not regularly played since then. I want to get it before anyone else gets their hands on it and tries to sell it. No one else would be interested in playing it. I am more than a little worried there will be cracks. Cracks can be repaired. they aren't a problem. Where do you live. Maybe someone can help you from this forum or recommend a luthier close by. Should be pretty close to you. He is located NorthEast Kansas. You can always just show it to him and ask his opinion. Don't make hasty decisions though. It's like going to a mechanic. You might want several opinions. This is wonderful, please let us know how this all plays out. Hopefully you can send some pictures of the Violin. I wish I had my fathers violin. Weather permitting, I hope to finally make it down to my Grandma's house tomorrow to pick up the fiddle. She is happy I am coming for it. Apparently one of my Dad's cousins was nosing around about it a while back, and she sent him packing. Apparently some fiddlin' buddy of my Grandpa's talked him into rehairing his bow with fishing line way back when. Has anyone ever heard of such a thing? So unless his spare bow is still intact, it looks like I will either need a bow or need to rehair Grampa's... unless this fishing line thing is for real. Any ideas? So exciting. Don't forget to post some pictures! We like seeing 'em both before and after restoration. WOW, good for you, to get your grampa's old fiddle. Personally i've never heard of using fishing line to replace horse hair on a bow, but somehow i'm not surprised at what people will / may do if they can't afford the real thing. As for the bow, unless it's cracked or broken, it can be straightened easily using a heat gun, being carefull not to get it too hot so it damages the finish. I straighten my bows whenever they begin to warp. I recently straightened one of my bows which is over 100 years old and it worked just fine, it's straight as an arrow now. Warpage is caused alot from the way the bow is held in the hand, it's usually tilted, in most cases, toward the player do to the position of the hand which in turn will cause the bow hairs on the bridge side to break first. This puts more pressure on the opposite side of the bow stick and pulls the tip causing the warp. Also, long periods of time being in the case can also cause warpage. I've put newly rehaird bows in the case, opened the case a year or so later and couldn't figure out why all the hair was either gone completely or all over the inside of the case. My Luthier told me it was moth's,, haha,, there's no sign of them in there, then I read an article that said it was carpet mites,, that makes more sence to me. But whatever you do with "Gramp's Fiddle", enjoy the heck out of it and keep fiddlin, no matter what. That does sound exciting. We'll be able to guide you a little as far as set up when we see the pictures in case you need help. Good on you for wanting to keep it in the family. If you go look on the new members intro page you can see some pics of my very old family fiddle that I finally for some unknown reason, had reglued, and then I polished, cleaned, and basically refurbished and now play every day! I'm obsessed I think. I leave it laying out and about 6-10x a day I walk by, stop... pick it up and throw a few licks on it... the videos on here are very brief but very informative and will get you up and running very quickly. I can't believe how easy it is to watch FM present such mysterious and complex bits of information is such a simplistic and easy way for us old guys to understand. LOL You shouldn't have any trouble learning. Keep in mind it don't happen overnight... this is just the first months of a life-long journey. Soon you'll be looking at a new case and pack it everywhere you go. On weekend trips, out camping, to the relatives for holidays, etc. I like to take mine out back on the porch and let the sounds echo across the canyon and listen to them threw the trees of our meadow. This old instrument was in my family about as long as yours has been. I can totally relate to your excitement. Take it slow, read all you can on this forum, web site and many, many others out there for a detailed education on the subject. Get some guidance on things and learn all you can. As everyone else has said, please post some before and after pics. They're worth their weight in gold, now and many years in the future. Your Grandma will be impressed as well. Keep her in the loop and maybe play a happy birthday tune for her when her next one comes around! Dionysia, count me in as also looking forward to pictures and your discoveries about your Grandpa's violin. My brother has one on his living room wall for decorating purposes; it belonged to my sister-in-law's Grandpa. Though my brother and I have done some investigating of it in the past, I have become so enlightened about violins, thanks to this site, that I can't wait to examine it again. Fiddlestix: Could you describe a little more specifically how you straighten your bow with the heat? I plan to purchase a carbon fiber bow from Fiddlerman.com, but would still like to know how to straighten a wood bow. cdennyb: That's wonderful that you refurbished your family violin and are so enjoying playing it. Very nice pics. cdennyb said: I like to take mine out back on the porch and let the sounds echo across the canyon and listen to them threw the trees of our meadow. I haven't taken any photos yet, but I think the fiddle is ready to play as is. I just need to get an acceptable bow. There are three in the case, and I think with a little effort I should have something usable. 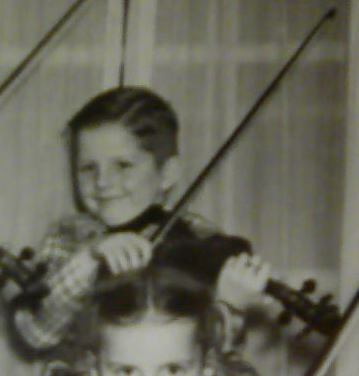 Now the story: My Grandma bought the fiddle for my Grandpa shortly after they were married. She didn't say if it was new or used, just that she paid about $15 for it. I have no idea what that translates to in today's dollars. He didn't like gut strings, so it has steel strings. He didn't like the pegs, so he ordered some kind of funky geared pegs from the Sears catalog. The gear things must work pretty good. From what I could tell, it is pretty much in tune even though it hasn't been played for about 20 years. Neat! Now I really want to see some pictures. I hope you have more luck with your bows than I had with my original. If not, they do look nice on the wall.